Berlin, the future, but close enough to feel familiar: In this loud, often brutal city, Leo (Alexander Skarsgård) – unable to speak from a childhood accident – searches for his missing girlfriend, the love of his life, his salvation, through dark streets, frenzied plazas, and the full spectrum of the cities shadow-dwellers. As he seeks answers, Leo finds himself mixed up with Cactus Bill (Paul Rudd) and Duck (Justin Theroux), a pair of irreverent US army surgeons on a mission all their own. 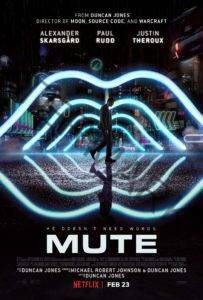 This soulful sci-fi journey from filmmaker Duncan Jones (Moon, Source Code, Warcraft) imagines a world of strange currencies in which echoes of love and humanity are still worth listening to.Mute is directed by Duncan Jones and written by Jones and Michael Robert Johnson. The film is produced by Stuart Fenegan. Charles J.D. Schissel and Trevor Beattie are executive producers.